The most interesting game of round 32 in the B League D3 was only three-point a home defeat of 7th ranked Kagoshima (11-14) to sixth ranked Tokyo Cinq R. (12-13) 82-79 in the game for the sixth place. Worth to mention a great performance of American forward Chris Olivier (203-92, college: Oklahoma St.) who helped to win the game recording a double-double by scoring 36 points (!!!) and 12 rebounds and Senegalese Bira Seck (204-90, college: Idaho, agency: Interperformances) who added 14 points, 10 rebounds and 4 assists during the contest. American center Antone Warren (208-93, college: Antelope Valley CC) responded with a double-double by scoring 25 points and 11 rebounds. Kagoshima's coach rotated ten players in this game, but that didn't help. Tokyo Cinq R. maintains sixth position with 12-13 record. Kagoshima at the other side keeps the seventh place with 14 games lost. Tokyo Cinq R. will have a break next round, and it should allow them to practice more before next game. Kagoshima will play again at home against Tokyo Cinq R. (#6) and it may be a tough game between close rivals. The game between Top Four teams took place in Tokyo. First ranked host Tokyo Excel. (23-2) defeated second-ranked Toyoda Gosei (19-6) 86-77. It ended at the same time the five-game winning streak of Toyoda Gosei. The winners were led by American center Ryan Stephan (208-94, college: Colorado Mesa) who had that evening a double-double by scoring 30 points and 12 rebounds and Jordan Faison supported him with 17 points, 10 rebounds and 8 assists. Even a double-double of 26 points, 24 rebounds and 6 assists by American-Irish Brian Voelkel (196-92, college: Vermont) did not help to save the game for Toyoda Gosei. Both coaches used bench players which allowed the starters a little rest for the next games. Tokyo Excel. maintains first position with 23-2 record. Toyoda Gosei at the other side keeps the second place with six games lost. They share the position with Koshigaya A.. Tokyo Excel. will again play against league's second-placed Toyoda Gosei in Aichi in the next round and it will be for sure the game of the week. Toyoda Gosei will have a break next round. Bottom-ranked Tokyo Big Blue (0-25) is still winless. This time they could not use their home court advantage losing their 25th consecutive match to eighth ranked Gifu Swoops (9-16) 100-90 on Saturday evening. The best player for the winners was Michael Allison who had a double-double by scoring 24 points, 16 rebounds and 5 assists. Andre Murray produced a double-double by scoring 31 points, 12 rebounds and 5 assists for the hosts. Tokyo Big Blue's coach tested twelve players, but that didn't help to avoid defeat in this game. Newly promoted Gifu Swoops maintains eighth position with 9-16 record. Loser Tokyo Big Blue still closes the standings. Gifu Swoops will have a break next round, and it should allow them to practice more before next game. Tokyo Big Blue will play again against Gifu Swoops (#8) and hopes to get finally their first victory. The game in Saitama was also worth to mention about. Fourth ranked Aisin AW (15-10) played at the court of 5th ranked Saitama Broncos (13-12). Aisin AW managed to secure a 6-point victory 92-86. Kevin Kotzur orchestrated the victory with a double-double by scoring 24 points and 20 rebounds. Aisin AW maintains fourth position with 15-10 record. Saitama Broncos at the other side keep the fifth place with 12 games lost. Aisin AW's supporters look forward to an exciting derby game next round, where their team will face at home their local rival from Aichi . Third ranked Koshigaya A. (19-6) beat at home 9th ranked Iwate Big Bulls (4-21) by 11 points 76-65, which is the biggest margin this round on Saturday night. It ended at the same time the two-game winning streak of Iwate Big Bulls. Worth to mention a quality performance of Kyle Richardson who helped to win the game recording a double-double by scoring 28 points and 16 rebounds. Both coaches tested many bench players and allowed the starting five to rest. Koshigaya A. moved-up to second place, which they share with Toyoda Gosei. Loser Iwate Big Bulls keep the ninth position with 21 games lost. Koshigaya A. will face again Iwate Big Bulls (#9) at home in the next round and are hoping to win another game. Third ranked Koshigaya A. (19-6) beat at home 9th ranked Iwate Big Bulls (4-21) by 11 points 76-65, which is the biggest margin this round on Saturday night. It ended at the same time the two-game winning streak of Iwate Big Bulls. Koshigaya A. looked well-organized offensively handing out 23 assists. Worth to mention a quality performance of American Kyle Richardson (201-91, college: Portland St.) who helped to win the game recording a double-double by scoring 28 points and 16 rebounds and the other American import Josh Peppers (201-85, college: Cent.Florida) who added 11 points, 10 rebounds and 4 assists during the contest. Four Koshigaya A. players scored in double figures. American center Marcus Cousin (211-86, college: Houston) responded with a double-double by scoring 22 points and 15 rebounds and point guard Imai Hiroki (181-92) scored 16 points. Both coaches tested many bench players and allowed the starting five to rest. Koshigaya A. moved-up to second place, which they share with Toyoda Gosei. Loser Iwate Big Bulls keep the ninth position with 21 games lost. Koshigaya A. will face again Iwate Big Bulls (#9) at home in the next round and are hoping to win another game. The most interesting game of round 32 in the B League D3 was only three-point a home defeat of 7th ranked Kagoshima (11-14) to sixth ranked Tokyo Cinq R. (12-13) 82-79 in the game for the sixth place. Worth to mention a great performance of American forward Chris Olivier (203-92, college: Oklahoma St.) who helped to win the game recording a double-double by scoring 36 points (!!!) and 12 rebounds and Senegalese Bira Seck (204-90, college: Idaho, agency: Interperformances) who added 14 points, 10 rebounds and 4 assists during the contest. American center Antone Warren (208-93, college: Antelope Valley CC) responded with a double-double by scoring 25 points and 11 rebounds and his fellow American import forward Shelton Boykin (198-92, college: Angelo St.) scored 18 points, 9 rebounds and 4 assists. Four Kagoshima players scored in double figures. Kagoshima's coach rotated ten players in this game, but that didn't help. Tokyo Cinq R. maintains sixth position with 12-13 record. Kagoshima at the other side keeps the seventh place with 14 games lost. Tokyo Cinq R. will have a break next round, and it should allow them to practice more before next game. Kagoshima will play again at home against Tokyo Cinq R. (#6) and it may be a tough game between close rivals. The game between Top Four teams took place in Tokyo. First ranked host Tokyo Excel. (23-2) defeated second-ranked Toyoda Gosei (19-6) 86-77. It ended at the same time the five-game winning streak of Toyoda Gosei. Tokyo Excel. forced 20 Toyoda Gosei turnovers. Their players were unselfish on offense dishing 21 assists. The winners were led by American center Ryan Stephan (208-94, college: Colorado Mesa) who had that evening a double-double by scoring 30 points and 12 rebounds and the other American import forward Jordan Faison (201-94, college: Cal Poly Pomona) supported him with 17 points, 10 rebounds and 8 assists. Even a double-double of 26 points, 24 rebounds and 6 assists by American-Irish Brian Voelkel (196-92, college: Vermont) did not help to save the game for Toyoda Gosei. American Patrick Simon (203-92, college: Seattle Pacific) added 9 points and 9 rebounds for the guests. Both coaches used bench players which allowed the starters a little rest for the next games. Tokyo Excel. maintains first position with 23-2 record. Toyoda Gosei at the other side keeps the second place with six games lost. They share the position with Koshigaya A.. Tokyo Excel. will again play against league's second-placed Toyoda Gosei in Aichi in the next round and it will be for sure the game of the week. Toyoda Gosei will have a break next round. The game in Saitama was also worth to mention about. Fourth ranked Aisin AW (15-10) played at the court of 5th ranked Saitama Broncos (13-12). Aisin AW managed to secure a 6-point victory 92-86. Aisin AW dominated down low during the game scoring 58 of its points in the paint compared to Saitama Broncos' 36. American forward Kevin Kotzur (203-89, college: St.Mary's, TX) orchestrated the victory with a double-double by scoring 24 points and 20 rebounds. Niyokwizera Yves contributed with 26 points and 9 rebounds for the winners. American center Joshua Crawford (211-88, college: Indiana St.) replied with a double-double by scoring 31 points and 20 rebounds and Masaya Ueda (177-93) added 24 points in the effort for Saitama Broncos. Both teams had four players each who scored in double figures. Aisin AW maintains fourth position with 15-10 record. Saitama Broncos at the other side keep the fifth place with 12 games lost. Aisin AW's supporters look forward to an exciting derby game next round, where their team will face at home their local rival from Aichi . Bottom-ranked Tokyo Big Blue (0-25) is still winless. This time they could not use their home court advantage losing their 25th consecutive match to eighth ranked Gifu Swoops (9-16) 100-90 on Saturday evening. 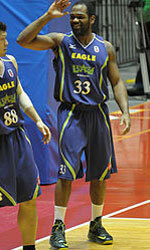 Gifu Swoops dominated down low during the game scoring 68 of its points in the paint compared to Tokyo Big Blue's 36. They looked well-organized offensively handing out 28 assists. The best player for the winners was Canadian center Michael Allison (206-90, college: Maine) who had a double-double by scoring 24 points, 16 rebounds and 5 assists. American Bingo Merriex (206-80, college: TCU) chipped in a double-double by scoring 14 points, 10 rebounds and 7 assists. Five Gifu Swoops players scored in double figures. American guard Andre Murray (188-87, college: Portland St.) produced a double-double by scoring 31 points, 12 rebounds and 5 assists and guard Tomoki Kitashiro (188-95) added 16 points respectively for the hosts. Tokyo Big Blue's coach tested twelve players, but that didn't help to avoid defeat in this game. Newly promoted Gifu Swoops maintains eighth position with 9-16 record. Loser Tokyo Big Blue still closes the standings. Gifu Swoops will have a break next round, and it should allow them to practice more before next game. Tokyo Big Blue will play again against Gifu Swoops (#8) and hopes to get finally their first victory.